The biggest challenge Kai and I faced in this project was time. In the beginning we thought that we would have finished putting in the pipe in the second week! We did not get the pipe installed until the week after spring break. I also thought the third week that we would have finished the gravel. 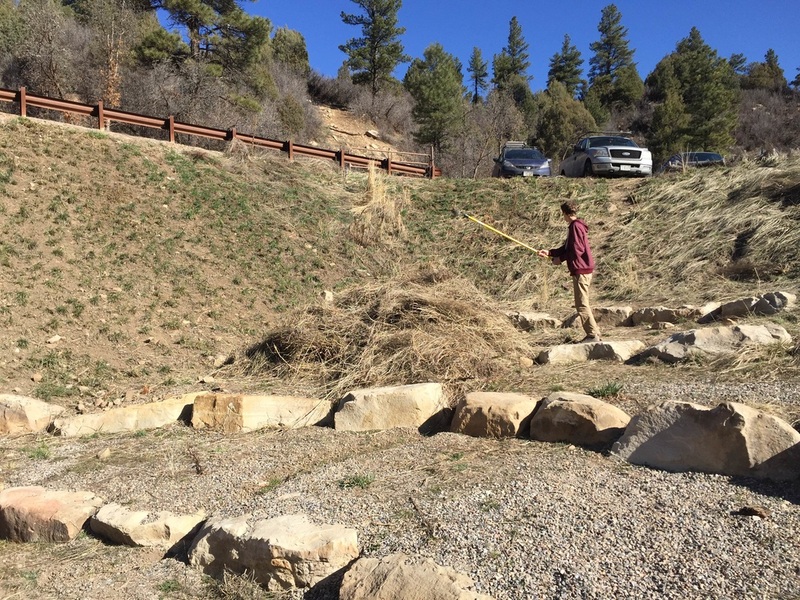 As you can see we were not very good at estimating time when we first started, because of this we started to get behind on work and made our priorities that we wanted to clean up the hill side and the weeds rather then changing the seats. We thought this was important because it made the space look very good and really changed the visual aspect of it. Because we fell behind in the beginning we had to make up for it in the end and the way we did that was by working during exploratory and xblock and even staying after school to complete this. This was our biggest challenge but we did overcome it by working outside of class. The one thing that I will remember is that I like active work and I like to be able to do something that's not just sitting behind a computer and typing up essays or doing research. I like to be able to work with my hands and do hard work that pays off. I really feel that this project was perfect for it because I was able to take two hours out of my normal school schedule and work outside and do what I really like. I feel that that the last two months have been really stress free and I feel a big part of that is because of doing this and being able to work outside. I know I will remember this in 10 years because I plan on having an active job where I can do this and I don't just have to sit behind a desk all day. I do think kids should get to do this across the nation because if you really do something your passionate about I feel you can find yourself in a whole new way. Going into this project I knew I liked working outside but I was never able to do a project that allowed it so this project was a great one to have! Along with finding what you really want to do for this project it really helps to be able to do something that is totally what you want to do. In this school we say that we can personalize topics and projects to meet what the student wants but that's only to an extent. In this it really was up to you on what you want to do and how you want to take it, and I feel that in other schools this is very rare and kids aren't able to do a project that they are passionate about. Ps. I would give the students next year more time to decide their project because I think we kind of rushed into it. Since our last blog post we have FINISHED!!!!! We have finished putting in the gravel and the pipe! It has been a long and hard two weeks of working on both of those. 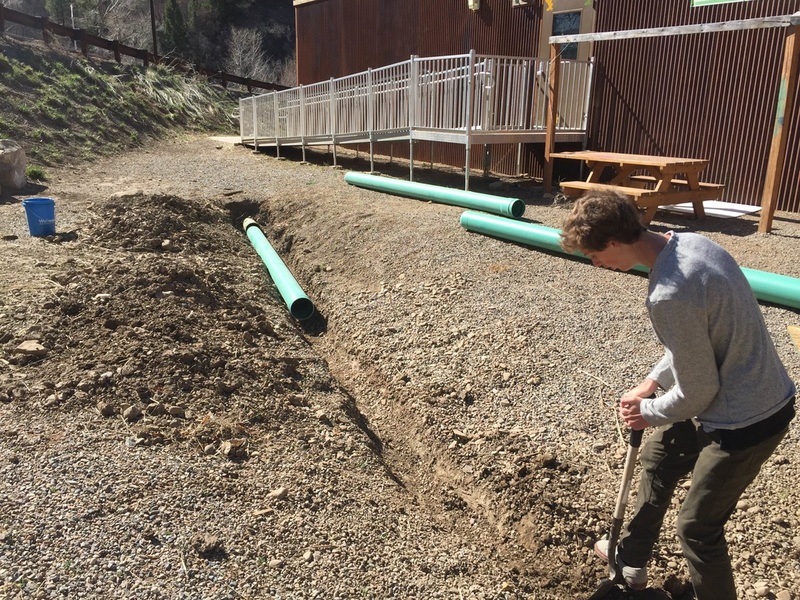 We finished putting in the pipe the week we came back from spring break and we finished doing the gravel last Friday. 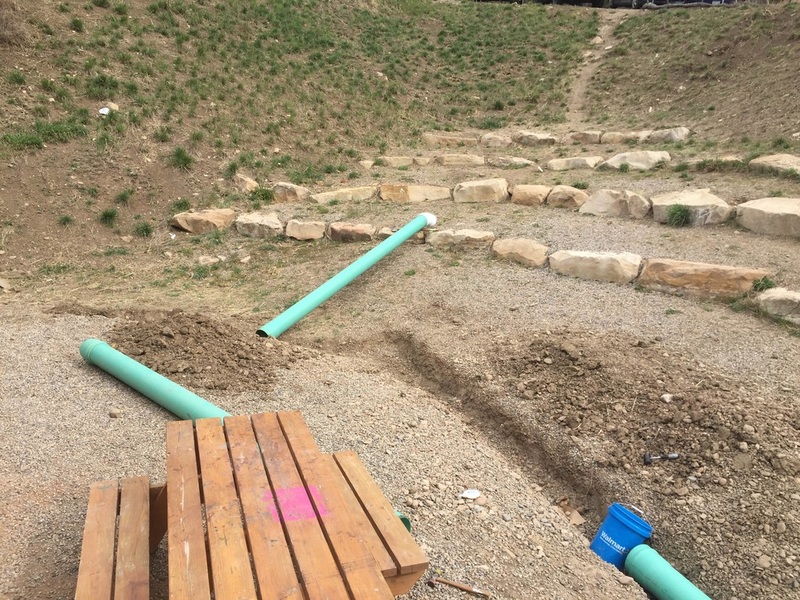 We used the dirt we ordered from C&J gravel to back fill in the pipe and then the gravel from the trebuchets to put on top and make it so that there is NO MUD at all! t has been very rewarding though to see all the work we have done pay off! I just went out and took some pictures of outside and I am very proud of what we have accomplished and what we have turned this space into! Major challenges have been time. Yes I know I'm beating a dead horse by saying that but we did literally use all the time we had. We used all of our humanities time either doing that or practicing our ted talk. Also every exploratory and x-block we had last week we used to move gravel, not only that but we stayed after school one day to make sure that it would be completed on time. Big shout out to the people who helped us during x-block and after school. We have learned that 10 tons of gravel doesn't go as far as you think it would. When you think 10 tons you think of and enormous amount of gravel. Well its not nearly that much and it takes more to fill a space then you would think. 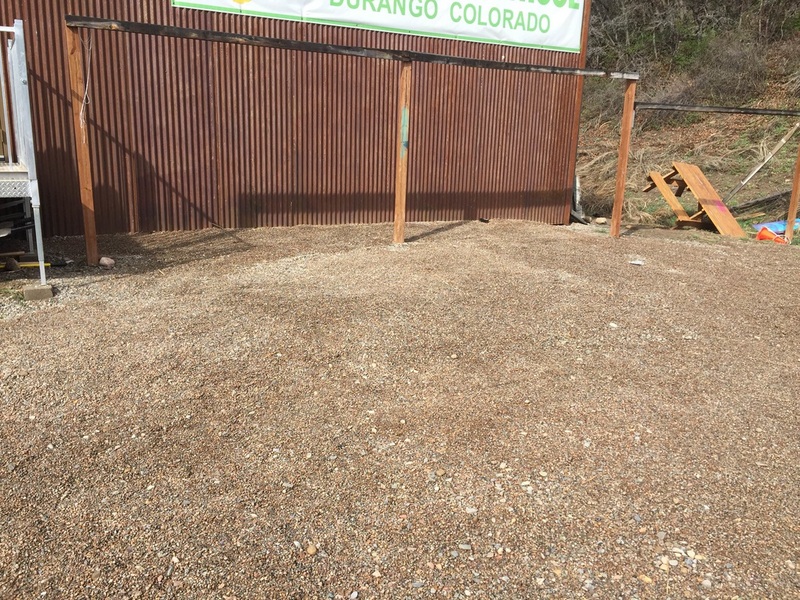 Also having another gravel pile was a blessing because that was what we used to really make it look good and to put the cherry on top and finish our design. From our last update we have learned about pipe and gravel. Before spring break we ordered 42 feet of pipe and a 45 degree union, along with that we ordered 10 tons of gravel! One thing that we have definitely learned is that putting pipe together is very hard (I will talk more below). Also with the gravel, we ordered 1.5” ABC gravel. One thing that I take responsibility for is not checking what that actually is. What we learned is that that is a mixture of gravel and dirt. Before ordering I thought it would be just gravel. So what we decided to do was use that to fill in the whole then use the gravel by the trebuchets to put on top. Even though we did have a bit of a mixup it still worked out good. Since our last post we have finished digging the pipe trench. We stopped because we didn't know where to dig since we were ordering a 45 degree union. So once we mapped out where everything would be we finished digging the trench. This week we have spent time doing that and trying to put the pieces together. One obstacle as I talked about above has been putting the pipe together. The guy that gave us the pipe said all you have to do was just shove it into the next one. We found this to be very hard because we have had two people pushing the pipe into the next one and it will not go. We have watched multiple Youtube videos and are hopefully going to solve that problem today. We are going to take a piece of flat wood, put it over the head of the pipe, and start hitting that with a sledgehammer to get it to go. We are pretty confident this will work. That has been our main obstacle and once that's done it will be just dumping loads of gravel! Today we did a gallery walk to start off humanities. Since ours was outside in the cold we figured before hand that not many would want to come out to look. Since we figured that was going to happen we decided not to have people come out and look, and instead got the chance to check out what other people are doing. We were able to just get around to almost everyone when the gallery walk was over. But a group of freshman came and we were able to show our work to one person. Looking back it at I wish we would have not looked at others and stayed and had people come look outside, because we could have gotten feedback and suggestions. Although one thing I noticed is people were more taking this as an exhibition and not a gallery walk for refinement. What I mean is from what I was able to hear and noticed people just looked at the projects, said what they liked and moved on. I wish we could have told them to give us critique and stuff. Since the last blog entry we have completely finished weeding and have it all in the trash!!! That is all we have been working on since Wednesday for two hours each day. 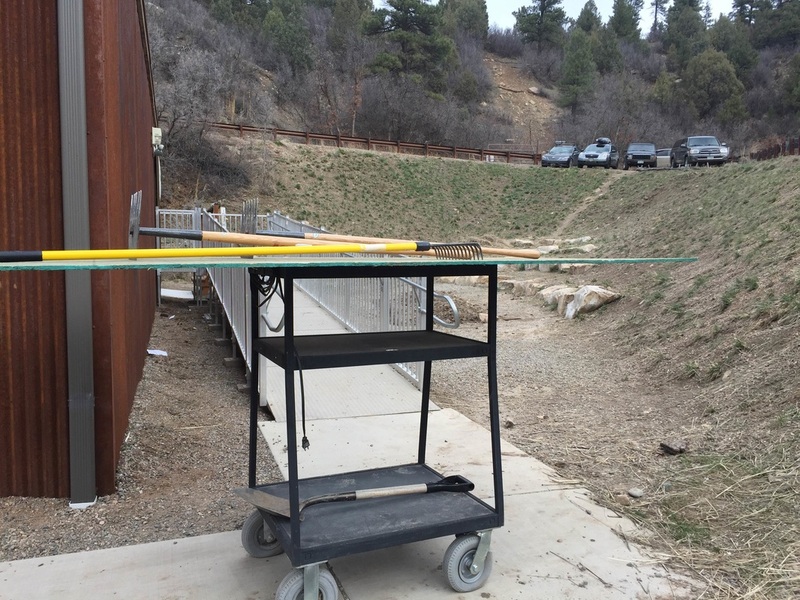 The way we brought all the weeds from the amphitheater to the trash can was a sweet rig which I will explain and show pictures. On Monday we had finished weeding but needed a way to bring all the weeds to the trash. We solved this by using our PAPER skills and adapted to what we had. We found an old computer cart with four wheels and a big piece of plywood we laid on top. We then would pile as many weeds as two people could carry on the plywood and then lift that and put it on the computer cart, which we would then wheel over to the big trash can and put all the weeds in there. Below is a picture of our rig. Also Kyle emailed us back and gave us info about doing a french drain. We don't think we can do the french drain because of time constraints and money. But he did draw a helpful diagram if we do. The only problems we had we loading up to many weeds on the cart (picture provided). Also time is our main enemy and problem right now because we will have to put in the pipe and move gravel next week. We may have to spend time after school working on it to finish. Our next step is to order the gravel and pipe which will arrive at the school over spring break which we will then start early tuesday morning and start cranking out putting it all together. Hopefully if all goes well we will finish just within the time given. Since my last blog post we have realized that we needed to call 811 before we started digging. Also we realized that we need a lot gravel to fill in the area back there. Will need ONLY 10 tons of gravel to do all the work. Also we learned we needed to call the Fire Marshall for her to approve the pipe extension and make sure we didn't have to apply for a permit from the city. Also a big piece was we emailed and face-timed our new mentor Kyle Grist who was helpful in planning out what we should do next. Since my last we have accomplished calling 811, calling the Fire Marshall, finding a pipe store, finding a gravel store, finding a mentor. We called 811 and they came by and we think they did checked our area out so now we are good to dig wherever we want! Also we called the Fire Marshall for her to approve our pipe and inform us on whether or not we needed to apply for a permit. Along with that we found that GJ Pipe carries the supplies we need, and when the time comes we will buy from there. 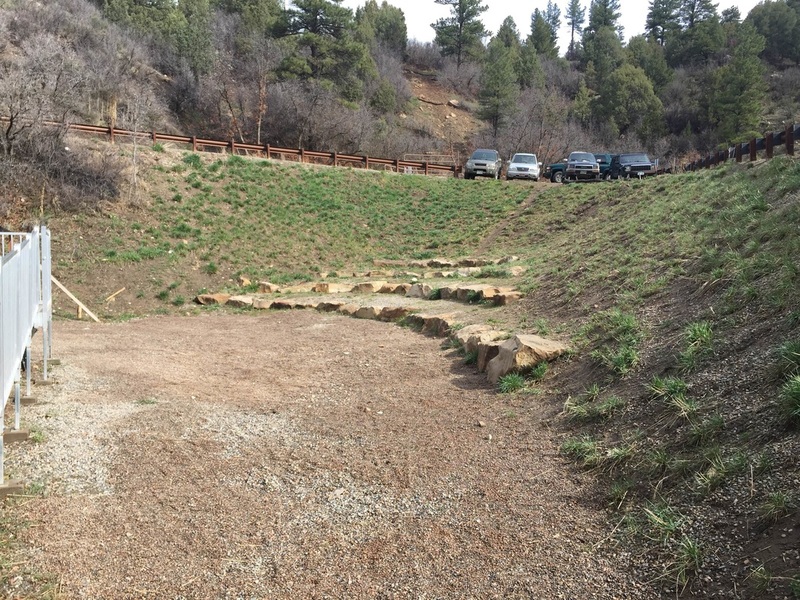 Also after looking online with Christine and Sean we found that C&J Gravel will be where we get gravel to fill in the amphitheater. The prices for the pipe are about $150 and the price for 10 tons of gravel is about $90. 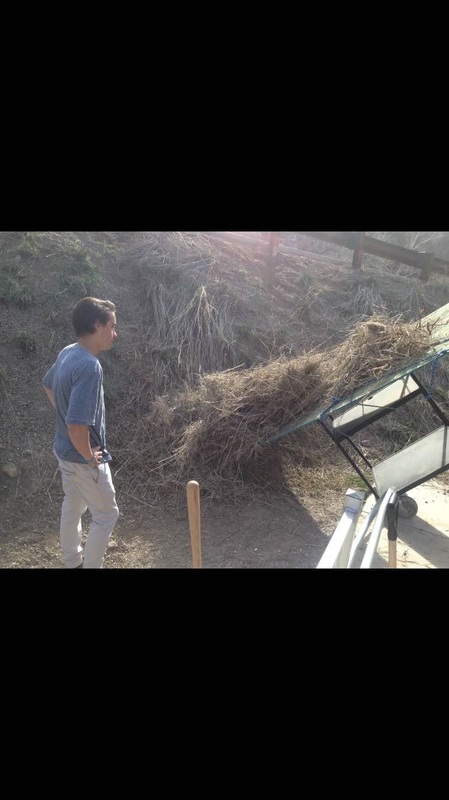 Also we had a meeting with our mentor Kyle Grist and we learned some helpful things that will aid us such as doing a french drain pipe and putting wild grass/wildflower seed up on the hill. Also we have started pulling the weeds down from the hill and have two humongous piles of dead weeds. Nothing has gone wrong luckily in my last blog post we were skeptical about a lot of things but in the last wee things have settled down and we are back on track for success. One thing that we are still thinking about is how we are going to get more seating in. Since we want to bring in more boulders for seating we realized that they weigh anywhere from 75 pounds to 400 pounds! So we will need equipment like a Bobcat or other big machinery to move rocks. Other than that our project is going good, and we have some decisions that need to be made on further progress. ​Our next plan of action is to continue digging and pulling weeds. One of us pulls the weeds off the hill while the other digs the trench for the pipe. This is a good system because we are not in each others way which means we are more efficient. Once the trench is finished we will order the pipe and put that in! 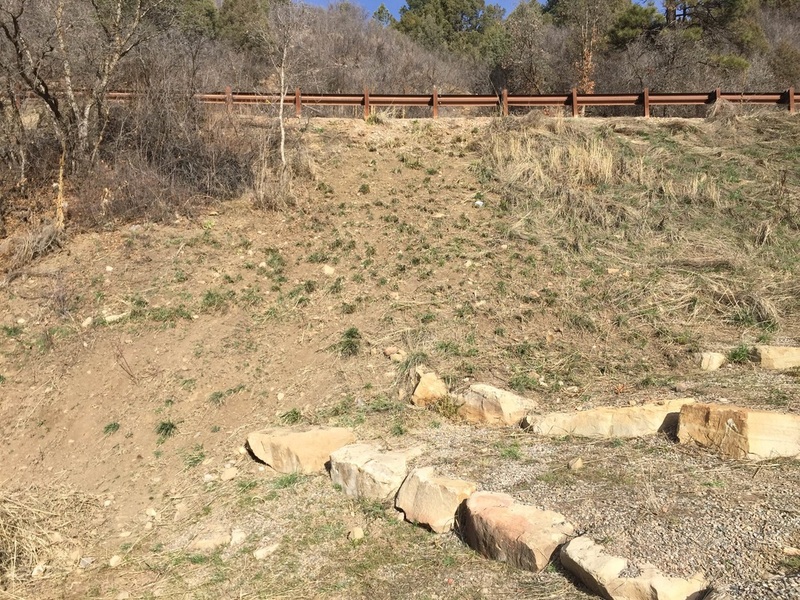 Below are pictures of our progress on weeding the hill. The pile of weeds on the right is about 4 and 1/2 feet tall! The closest picture to the text is the most recent. This week have learned that buying pipe is going to be hard. After looking on websites and going to Home Depot we found that the pipe we need is going to be hard to find, and when we do find it, we're guessing it's going to be pretty expensive. Also Dom helped us measure the pipe and said he could help with putting it in. Last after this being our second week working we found that digging trenches is very hard and exhausting work that tires you out for the rest of the day. We been able to get more and more work done every day, each day more efficiently done than the last. Since my last blog post we have accomplished a lot in digging the trench since we've only had one day since our last post we made a ton of progress. The pictures below show what we accomplished. The one closest to the text is what we did Friday and the one below that is what we did yesterday. We have found our pace and are becoming more efficient in digging. As I talked about above we have struggled with finding pipe that will work, hopefully we will be able to find it by the end of the week and order it. When Dom helped us out we found that we need 40 feet of 8" diameter blue pvc pipe. We figure that the pipe only comes in 10 foot sections so we will need to buy connectors to put between the pipe. Our next step of action is to continue to dig out the trench and finish by the end of the week. That will not be a problem seeing how far we got yesterday. Also we need to work hard on buying the pipe and that is our main focus right now. Other then that everything is going smooth! In my last post I talked about doing a field or possibly putting down a material in the lower lot. After an informative meeting with Libby, we found that doing either of those would take a lot of time and funds, as well as coordinating with Twin Buttes and would possibly be not worthwhile. Instead we came up with the idea to transform the west building amphitheater into a more beautiful space. Some of the ways will be: creating better and more seating, pulling weeds, making the ground level and putting in decorations. Bellow are a couple before pictures, I took a lot of pictures before so that we can have something to compare to when we finish here are a couple of them. Some of the big things we learned this week are: that we had to move a lot of snow to get down to the dirt, we need to dig about 6 inches down to dig out the pipe, and that we will need a lot of gravel. When we first walked out there there was a ton of snow covering up where we need to be working. We have spent about 2 and a half hours clearing the snow and moving it to a spot that it will get melted. This a long and tiring process that has exhausted all so that we can have a dry space to work. Also after digging out the snow and seeing the pipe we need to dig down about 6 inches to completely uncover all the mud that is in it. Last to level out the area we will need a huge load of gravel. Because the school has a budget that needs to be spent this year we will also be putting gravel in other places around campus. Since were doing this extra work this gets rid of the need to do fundraising. We have accomplished creating a successful plan that has been approved by Christine, Sean, Dom, and Libby. Also by working hard now, and moving the snow out of the way we will have dry ground to work with later. Also another piece we have accomplished is knowing that we can dig down and put an extension pipe in. Also that we can have gravel delivered. The main challenge we have faced is the mud outside as I talked about before we are trying to eliminate that by getting rid of the snow. Also the other challenge will be that digging a trench in the dirt/mud will be a very exhausting task. Our next step is finishing getting rid of the snow and starting to dig out the pipe so we know what kind of pipe to buy for the extension one. I think if all goes next week we will be able to dig out the trench and order the pipe. If we finished the digging and are waiting for the pipe to arrive we will start working on the seating and digging out spots for the new seating. 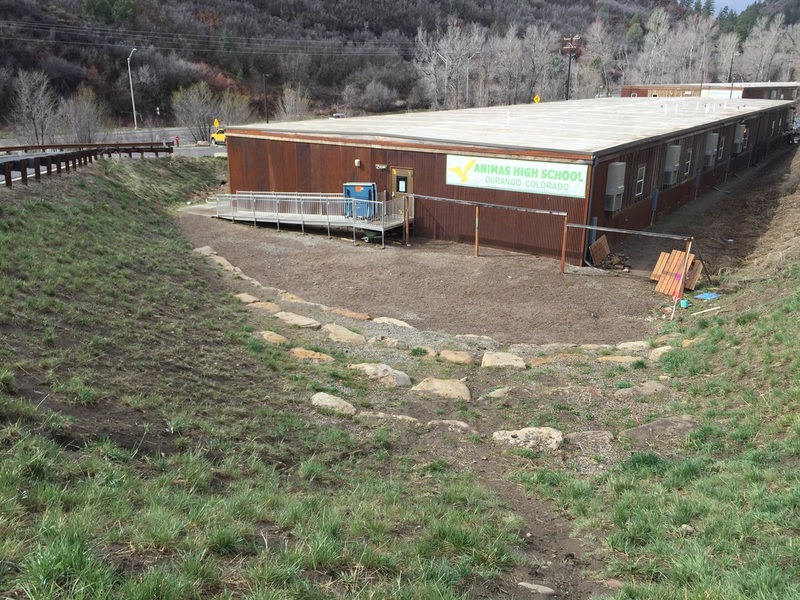 For my project I'm planning on doing something related to making Animas High School better for future classes. The picture to the left are some brainstorming ideas of problems in the community. As I was thinking about it, I found I wanted to work on Animas because there are problems here that should be fixed. 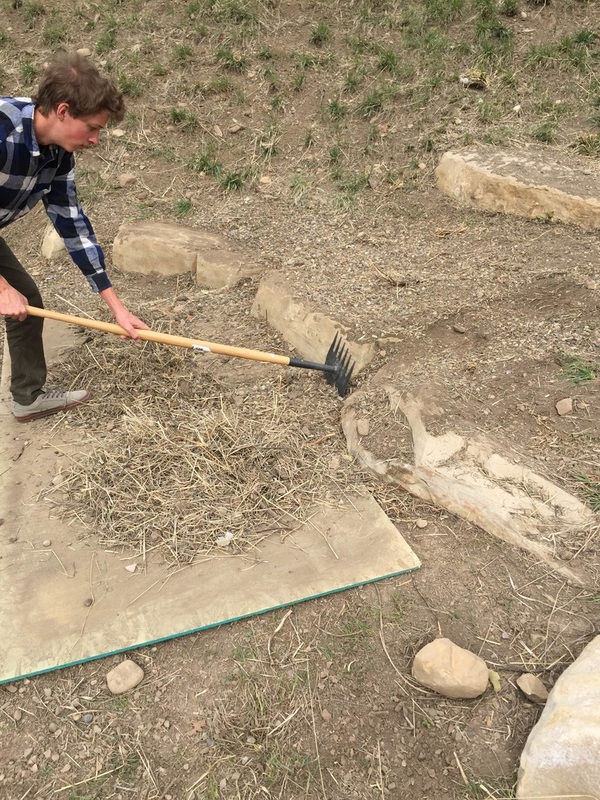 Some of the ideas that I have come up brainstorming about this are: constructing a grassy field on or near campus and also cleaning the parking lot up and putting down a material so that it will not be muddy. My audience for this is everyone who goes to Animas, I think people will want to help or give to this process because this does solve solutions that are a pain to deal with. For example during X-block we have to play ultimate frisbee on gravel coated asphalt which many people have slipped on and injured themselves. Also people who park in the lower lot have to deal with getting there cars and there shoes dirty every day when trying to leave school. So both of these ideas would solve problems that a good portion of the school can and will use. To me student centered learning is all about personalization and student choice. Through this the student can choose what he or she wants to create during a project, which gives the ability to make a project that you are passionate about. Audience centered learning is all about catering to what the curriculum says and what the state wants you to teach. And it doesn't show the bigger picture and go into as much depth as say student centered learning would. I have not accomplished a lot so far during this process. But I do have a good and solid understanding of what I want to do and create. 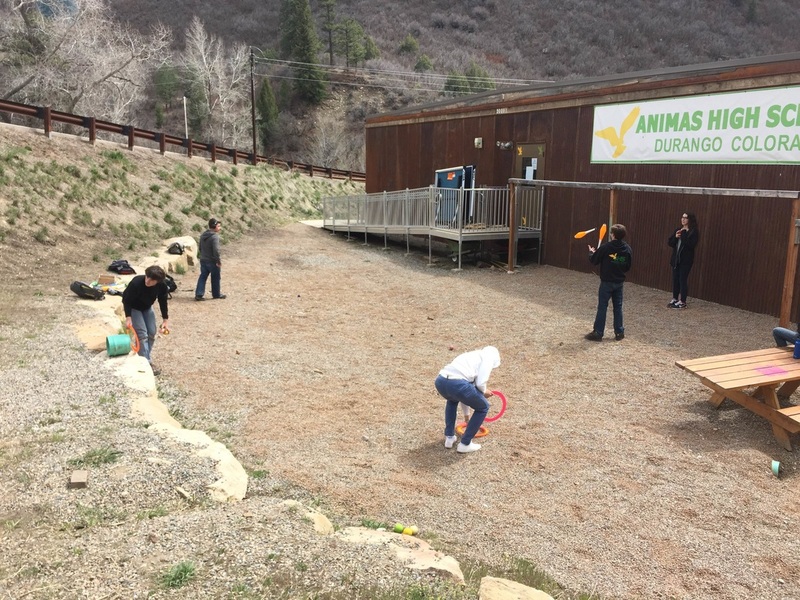 I am hoping that one of these ideas gets the go and is allowed because I really want to do something that involves physical work and that betters Animas as a school. My next step is I am going to meet with Libby and talk about these ideas I have stated above. With good evidence and a big problem that needs to be solved I feel that one of these solutions will work when I bring it up to her. From there it will be straightened arrow and I will be off!